There has been a trend of wall stickers and wallpaper recently - by trend i might mean overkill… oh and dont forget wallpaper in the shape of silhouettes, etc. So that being said, it takes a lot to get me excited about something in this category lately… so enter, german, Daniel Grafik - a brilliantly talented illustrator/designer, who has taken some less traditional characters, mixed them with some more traditional wallpapers, and there are some really fun ones in the collection (see more images below). Also that particular stamp set - LOVE the crazy exclamatory speech bubble of sorts, not to mention that little squirty squid like fellow. D.L & Co, the “Modern alchemists and purveyors of curious goods” i’ve written about previously - enticed me into their dark mysterious world of curiosities in what i’d normally consider an over-flashy site (the reflection on black is slightly overused in the nav i think… hurts my head) ~ and gotten me hooked somewhere between their calming music and their Art Noveau collection as it keeps morphing between black and red versions… you must admit there’s something very tord boontje about these etchings… This collection of fragrant candles were inspired by the fin-de-siecle. When is a tree not a tree? 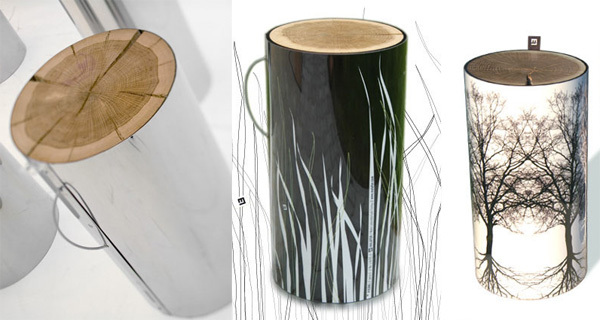 Or is a tree still a tree if its chopped to a stump, and then covered in polycarbonate that is screened with cow prints? 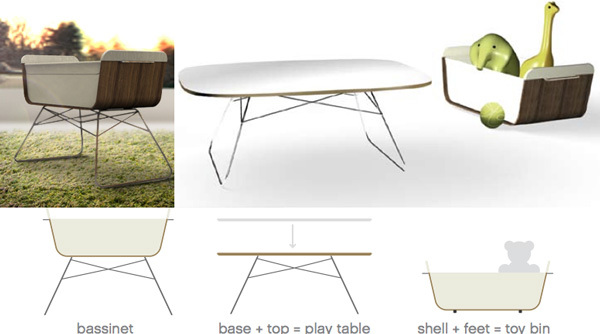 I’m not sure exactly - but these were strangely appealing… instead of making that next tree into firewood, coat it in steel and use it as a stool, side table, or a coffee table base? “The inside is the European oak wood dried in a special dryer for 2 months.Then it’s covered in steel sheet or in polycarbonates with silk screened images of tree, grass or leaves. The bottom surface of the trunk has a felt protection, so it doesn’t scratch the floor.” Produced by Malafor Small Laboratory of Forms. For more info, contact Gosia I. Korsakowski at bluebellgk-at-yahoo.com - more pics below! 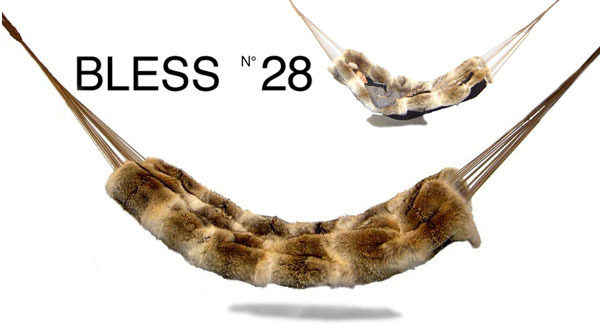 On different takes on weather changes… German Bless’ No 28 adresses Climate Confusion Assistance through a line of products including this Coyote Hammock (which is really terrible, but visually mesmerizing - so make a faux one! ), a hammock that resembles a couch, jogging pants with fishing nets, “ring gloves” (just the finger tips of gloves), scribbly pins and more. Clampology: is it a religion? a science? a way of life? Or really just some brilliantly functional plastic with some spring action clamping? Maybe all of the above. The Jorre van Ast site describes it as “Clamp-a-book, clamp-a-hook, clamp-a cable… Design solutions derived from the clamp typology: a family of objects, each with a specific function. 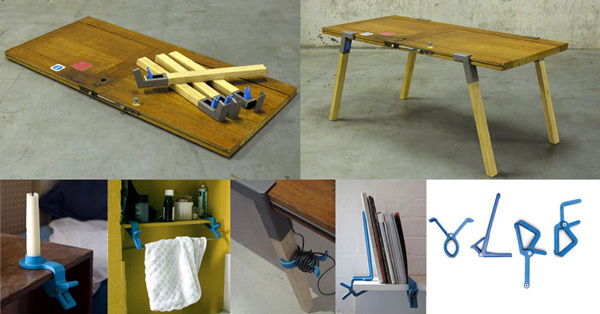 The collection of these informal utensils includes a book stop accompanied by a book finger, a book display, a hook and a rail that clamp onto the side of horizontal surfaces, a hook to clamp on to electrical pipes, a candle holder, and a cable manager that can be clamped onto a table leg.” Brilliant. Thanks, RUGenius. 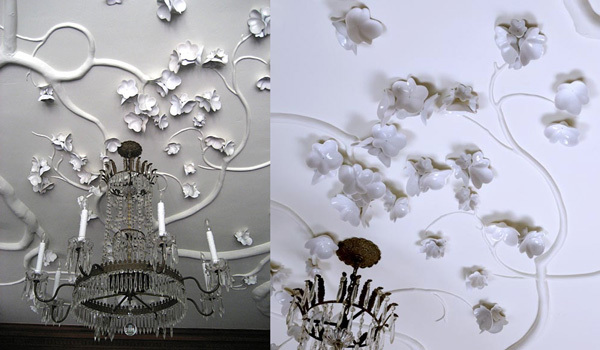 Been staring at LisaJay’s post over at .org all morning, and i can’t get over David Wiseman’s ceiling. His ability to have things emerge out of walls oh so subtly makes my head spin. Something about this ceiling (and listening to the Marie Antoinette soundtrack right now) ~ i could picture it being in the film. Versailles needs this! Or my studio… someday. 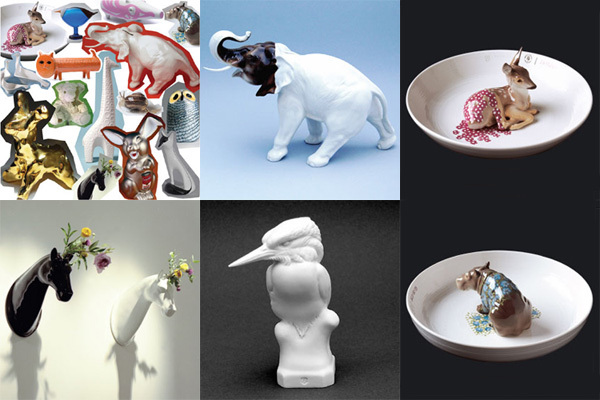 I have a softspot for the work of Tord Boontje. (see all these posts?) And so you can only imagine how i’m feeling tonight discovering his line for Target. It’s gorgeous, insanely affordable, and only available online ~ i have pics of most of the products below. My favorite is the line you see above though… the Multicolor Dinnerware Collection… especially the bowls and the dessert plates. 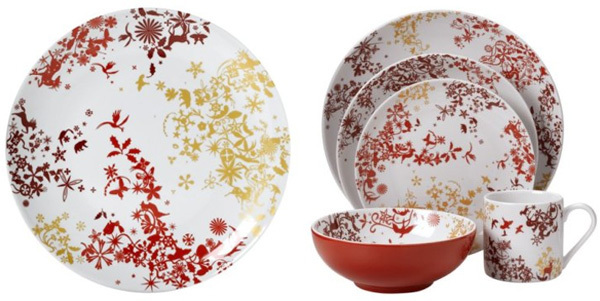 There is also another holiday collection of Dinnerware, a holiday party pack (paper plates, cups, napkins, etc), candelabra, and candle holders. P.S. here’s the link to the Target Red Hot Store for it. So while i keep telling you i’m not nearly ready for the baby making ~ i can’t seem to get away from posting more brilliant designs that are popping up for new parents. Remember Ooba (old post here)? Well they took that gorgeous bassinet further, and made it more functional … Basically the bassinet with the addition of a table top and feet for the toy bin. (not that the diagram wasn’t incredibly clear already). 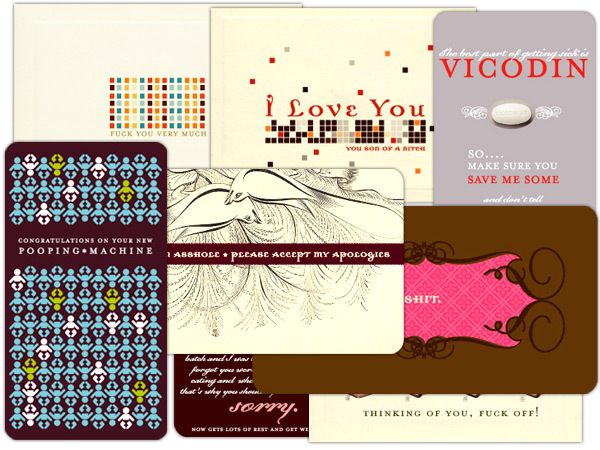 These cards are so much fun i spent two days trying just to make an image for this post, and loved so many i ended up giving up, and Shade Elaine stepped up and collaged some of our favorites for you. (More of my favorites below.) Welcome to the best greetings card line i’ve seen yet ~ O Plus D ~ via the lovely ladies of the Fabulist. 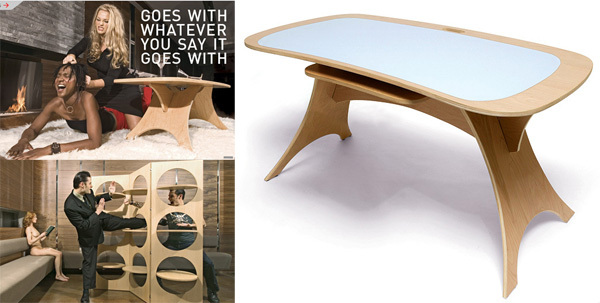 I have a thing for vintage Scandinavian furniture, there is something inspiring in those curves and wood. So when Baxter & Liebchen in Dumbo had their showroom open during the arts festival, i had to take pictures to share with you. Their walls of lamps and chairs and mirrors are breathtaking and sparking ideas left and right as i stare at them.